We usually don’t see the whole picture. This is a little story I read that sort of puts that in focus. I have no idea if the story is true or if it was made up to make a point. No matter, I like it. Life is more than today, so don’t get too set on what’s happening today. Have faith and look ahead to tomorrow. Enjoy today, but don’t let today mire you down. 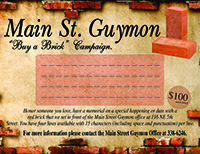 We’ve got a survey out on the Main Street Guymon programs so that we can see just which programs the community really does care about. It is pretty senseless to keep ones that the community doesn’t like. We have over 100 returned at this point, which isn’t very many considering our population, but it is 100 more opinions than we had last month. It would be a help to us if you would take the survey. Just email me at Director@MainStreetGuymon.com and I’ll send you the link. There are 24 questions and it takes about 4 minutes to do it. Another opinion that you might need to think about giving is the election on April 2. We are lucky to have an abundance of candidates. Make your opinion count and vote. It’s a good day to be living in the Oklahoma Panhandle!